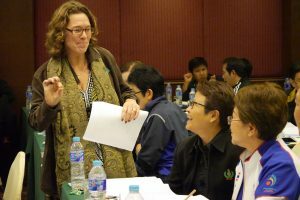 Dr. Bonnie Tiell, a United States Sports Academy National Faculty member and doctoral graduate, teaches students at the Sports Authority of Thailand in Bangkok. 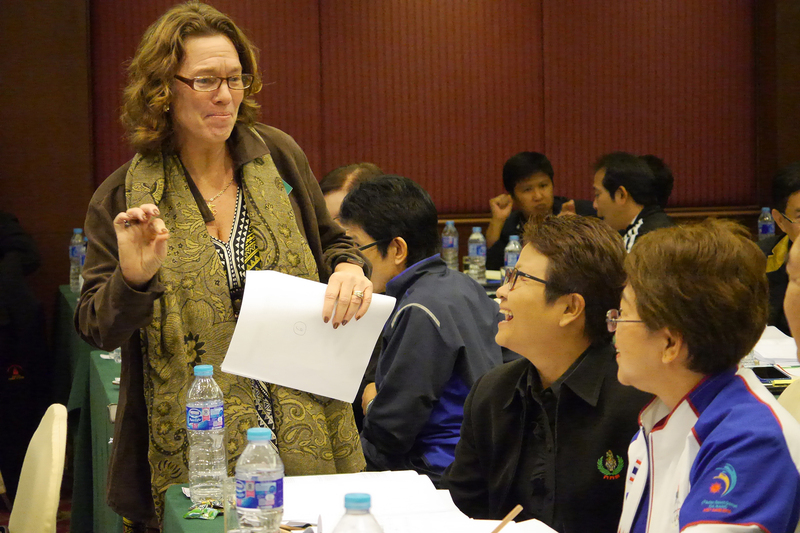 DAPHNE, Ala. – United States Sports Academy national faculty member Dr. Bonnie Tiell of Tiffin, Ohio, recently took part in the Academy’s program to teach sports management to students from the Sports Authority of Thailand (SAT) in Bangkok. Tiell, Professor of Sports Management at Tiffin University, is recognized for her contributions to intercollegiate athletic administration and global sports. 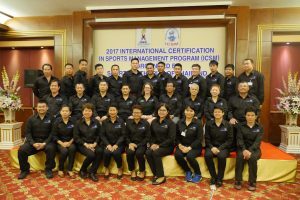 She taught the Academy’s International Certification in Sports Management (ICSM) program in Bangkok, a program that has been in place for more than a decade. She earned a Bachelor of Education degree from Troy University, a Master of Sport Administration degree from the University of North Carolina-Chapel Hill, and a Doctor of Education degree in Sport Management and Human Resources from the United States Sports Academy, where she was recognized as the 2014 Alumna of Year. 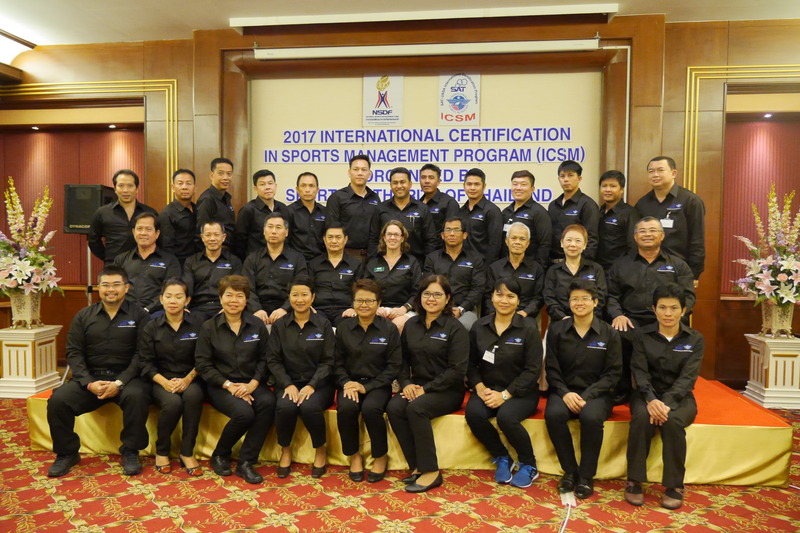 The ICSM, along with the Academy’s International Certification for Sports Coaching (ICSC) program, prepare participants for leadership roles in sport. The ICSC program includes a wide range of coaching and related administrative skills, while the ICSM program includes management topics such as sports event planning, marketing and public relations, and facilities. Dr. Bonnie Tiell, center, a United States Sports Academy National Faculty member and doctoral graduate, poses with students at the Sports Authority of Thailand in Bangkok. Tiell works with members of the World Olympians Association, which has supervised educational programs at the Olympic Games in Athens, Greece; Beijing, China; London, England; and Rio de Janeiro, Brazil. She has presented research, taught, or collaborated on sports projects throughout five continents and has extensive publishing experience. She is the co-founder of the NCAA/NACWAA Women’s Leadership Symposium serving almost 1,500 female students and aspiring administrators in college athletics. At Tiffin University, Tiell has served as Dean of Graduate Education, NCAA Faculty Athletic Representative, MBA Chairperson, Senior Woman Administrator, Assistant Athletic Director, and Head Coach for volleyball, softball (national qualifier 1993) and tennis (national qualifier 2003). As a former recipient of the Region 4 Excellence in Teaching Award through the Accreditation Council of Business Schools and Programs, Tiell is also a member of the Tiffin University Athletic Hall of Fame and recipient of the 2013 Great Lakes Intercollegiate Athletics Conference Donahue Service Award.